NEW YORK (CNNMoney) -- Can a housing market simultaneously be the most undervalued in the nation and one of the worst housing buys? It can if it's Las Vegas. Sin City recently drew a rating of "Frankly Dangerous" -- the worst possible -- from Local Market Monitor, a North Carolina-based firm that provides investors with analysis on local conditions. The only other city to get that kind of thrashing was Orlando, Fla.
Las Vegas received a paltry rating even though median home prices there are less $145,000, which is more than half of what they cost at the peak of the bubble and nearly 30% less than what Local Market Monitor calculates would be an "equilibrium price," or fair market value. The equilibrium price is based on economic and population growth, construction costs, vacancies, household income and interest rates with an "X Factor" thrown in. That's a value company founder Ingo Winzer comes up with based on 20 years of market data. The X Factor is a mathematical constant, unique for each metro area, that represents the premium or discount that buyers have paid for local homes in the past. It captures the tendency for buyers to pay more for homes in what they consider more desirable locations. A city like San Diego, for example, with its enviable weather and ocean-side location, commands more of a buyer's premium than does, say, Buffalo, N.Y. The factors that make Las Vegas's rating so negative mostly revolve around issues of employment, according to Carolyn Beggs, COO of Local Market Monitor. "Las Vegas has a high concentration of jobs in sectors such as manufacturing and construction, which are considered volatile," she said. She contrasts that with the Stockton, Calif., housing market, where home prices are nearly 20% under the equilibrium price, but which the company rates as an average risk. "Stockton has a higher concentration of jobs in healthcare, education and government," Beggs said. 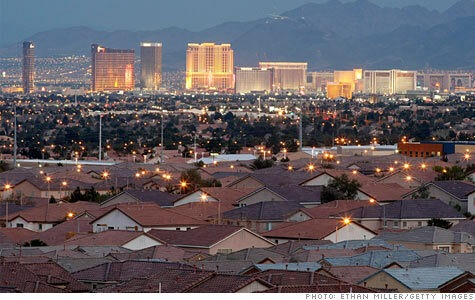 Both Las Vegas and Orlando have a glut of homes for sale, thanks to years of overbuilding during the housing bubble. They're also two of the hardest hit foreclosure cities and have suffered outsized price declines, with Vegas values down 52% from their peak and Orlando 39%. Most crucially, the economies of both cities have a heavy reliance on development, which has taken a huge hit in both places. The most overvalued area right now is the Long Island, N.Y., counties of Nassau and Suffolk, which are suburbs of New York City. The current average home value there of about $418,000 is 26% higher than the equilibrium value of $318,000. Even so, Local Market Monitor still gives it a "Typical Risks/Rewards," rating, an average score. One particular positive factor there is a bright economic picture with unemployment at only 6.9% and some job growth expected this year. Other overpriced markets include Los Angeles and Portland, Ore., both overvalued by 24%, and Santa Ana, Calif., 23%. Akron, Ohio, is the second most undervalued market at -22% followed by Cleveland and Warren, Mich., at -21%.